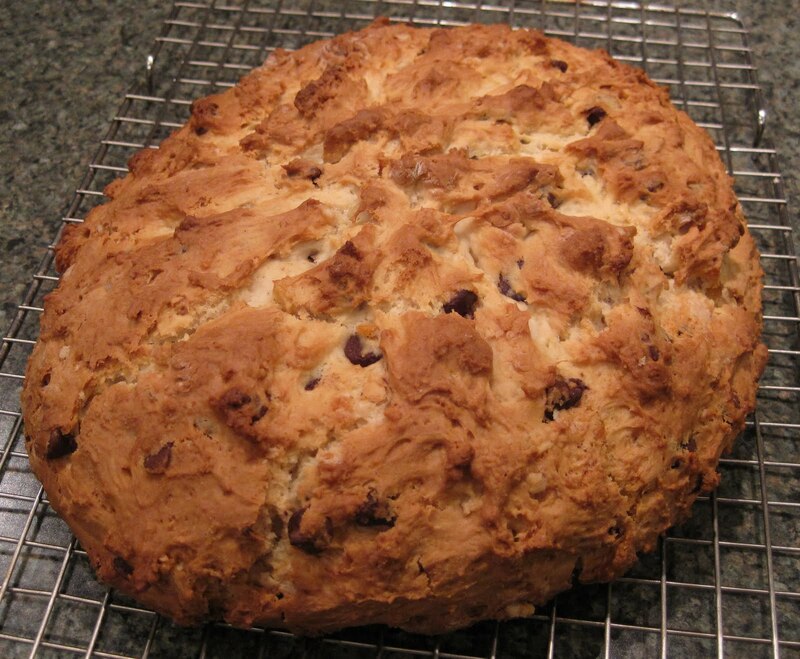 This past weekend, I (we) finally tried a recipe that I cut out of the April 2005 issue of Bon Appetit: Soda Bread with Dark Chocolate & Candied Orange Peel. Have I mentioned before how much I love the combination of chocolate & orange? I do. 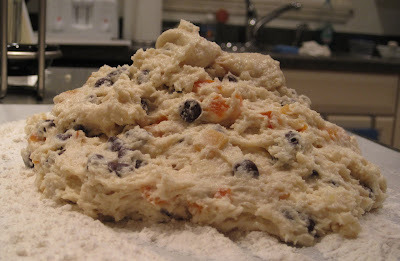 One of my favorite cookies is an Orange Chocolate Shortbread (that recipe is also from Bon Appetit!). 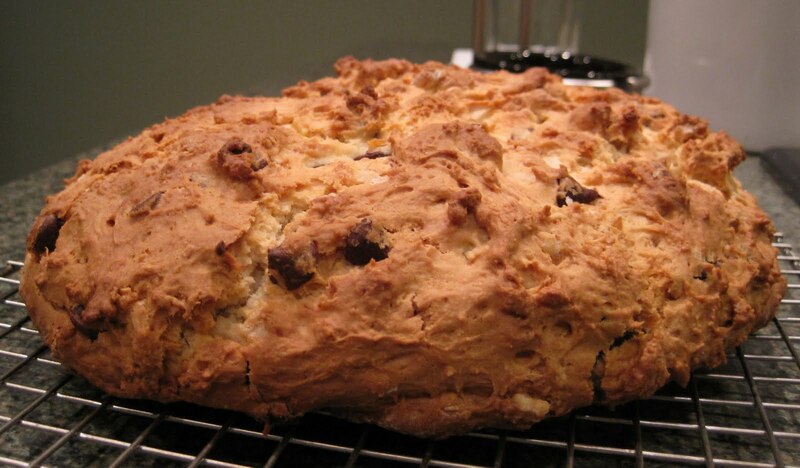 Orange-Chocolate Biscotti. Orange Milanos. Chocolate & orange is just a terrific combination. 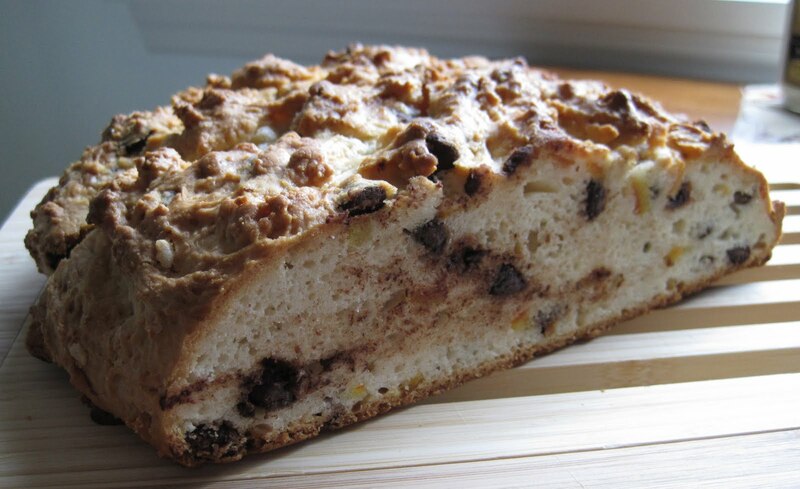 Bread with chocolate and fruits/candied fruits seems, to me, to be more of a dessert thing than a 'bread with meal' thing. 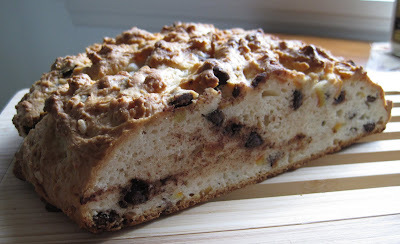 So as we were pondering the week's menu, ok, more like what dessert I'd be enjoying because we all know I must have dessert, this bread popped into my mind. 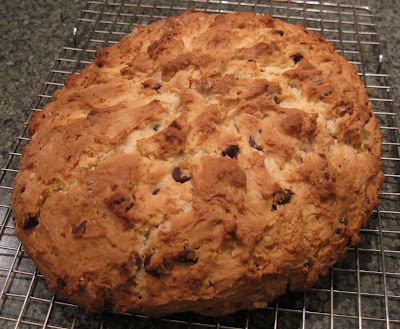 It also seemed, for some reason, like it would be a good bread to snack on during the Steelers game (it was). And, it was on my 'To Make' list. 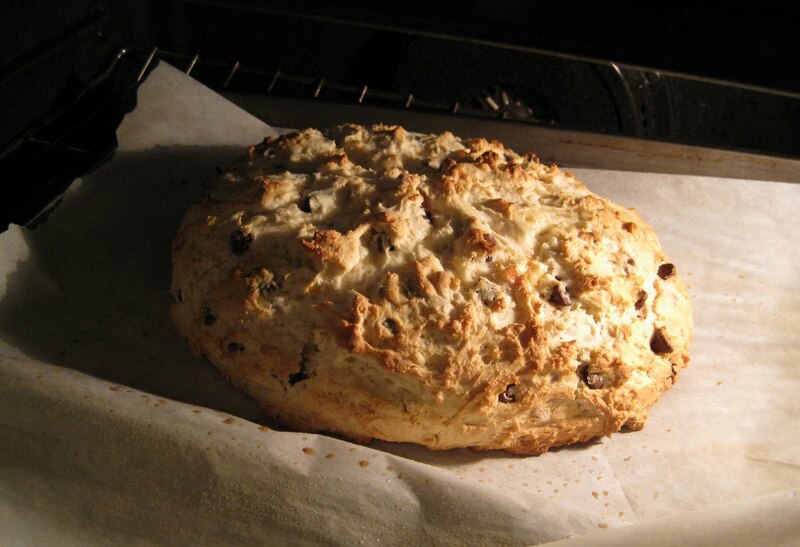 What I liked about this recipe when I cut it out: a bread recipe without yeast and without a lot of fuss. 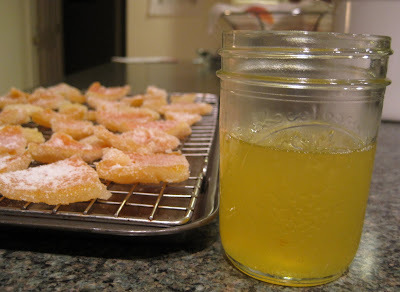 What I didn't like: this candied orange peel business. "Unusual ingredient" -- that's what candied orange peel meant. But the HUGE Giant Eagle Market District (GEMD) is right down the hill, and surely if they sell rattlesnake they sell candied orange peel, right? Turns out that making candied orange peel is very simple, just time consuming, and it requires planning because the orange peel needs to dry. 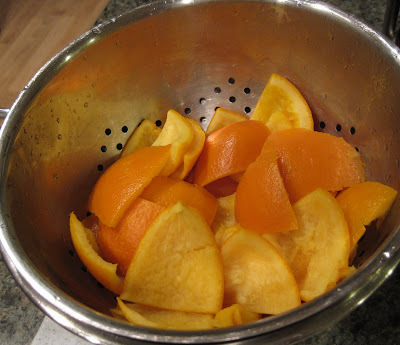 Good thing we got our oranges Friday evening and started making the candied orange peel that night! 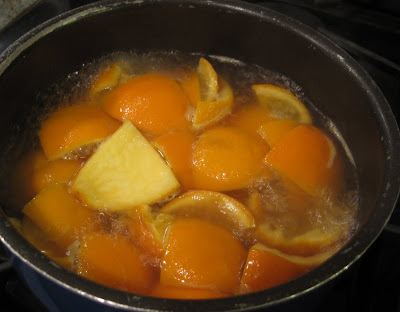 SP peeled the 4 oranges and put the peels in a pot of boiling water. We snacked on the oranges and he squeezed a couple of them (for orange martinis!). The particular 'method' we followed required boiling the peels for about 5 minutes, draining them, then boiling them again in a fresh pot of water. The peels are boiled a total of 3-5 times. We think the boiling is not just to soften the peel but also to 'boil away' any bitterness. How do you know if the peel is soft enough and if the bitterness is boiled away? It's simply a guess. I suppose you could taste the peel, but, we figured that after 3 boilings, 5 minutes each, for a total of 15 minutes, they were OK since we had seen a few recipes that said to boil the peel for one 15 minute session. We drained the peels, reserving 1 cup of the water. Next, you make a simple syrup: 1 cup sugar dissolved in the 1 cup reserved water. 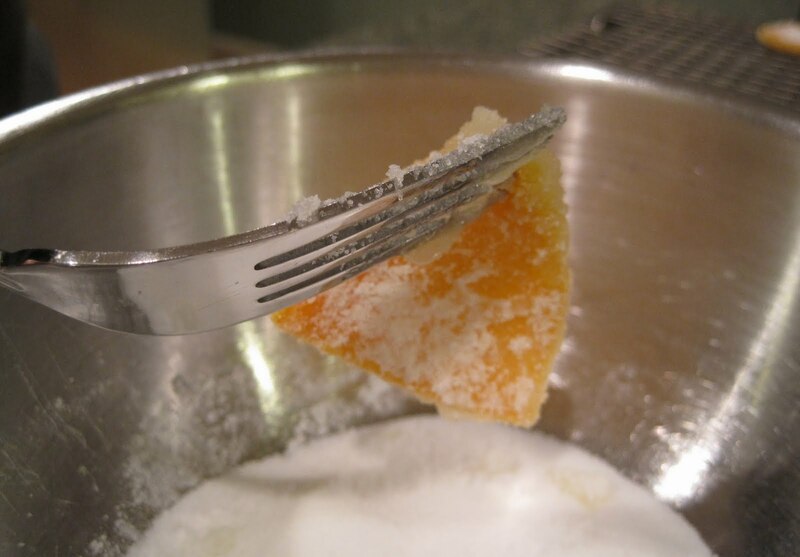 While the sugar dissolved, SP scraped the white pith from the boiled, softened peels: Once the sugar is dissolved, the peel is placed in the simple syrup and simmered until nearly all the syrup is gone: Then the peels are coated in sugar: And placed on a cooling rack: We saved the remaining orange-y simple syrup (it was a nice addition to my orange martini on Sunday): We started the candied orange peel process at 9 pm on Friday. We weren't completely done until around 10:15 pm. 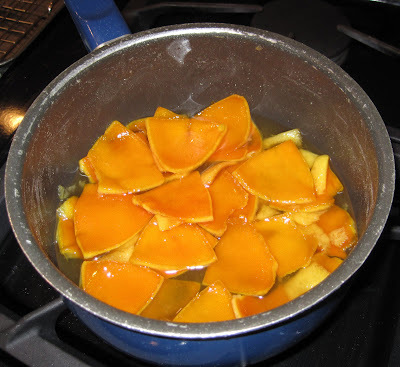 Since the candied orange peels need to dry, and since we have our fair share of creepy crawlies (spiders, centipedes) and flitting moths/flies/gnats that find their way inside, we placed the candied orange peels in the oven overnight to dry. We did NOT turn the oven on - it was just to keep bugs off. 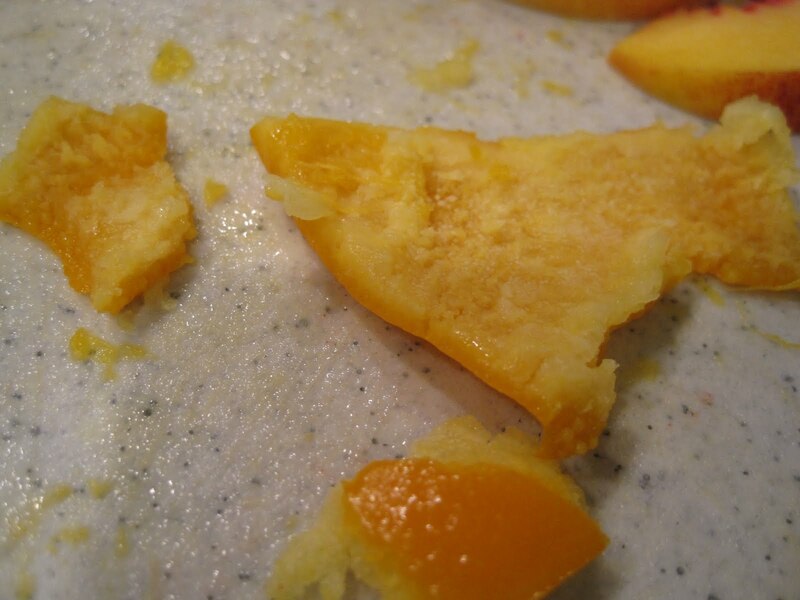 However, I did read some comments online from people who 'sped up' the drying process by placing their candied orange peel in the oven on low (170) until it was dry. We debated trying that, but were a little fearful and opted to just let them dry in an unheated oven. Our 4 oranges made more than enough peel for this recipe (it calls for 6 oz). Two oranges might not be enough, so next time we'd probably do 3 oranges. Also, before making the bread, we chopped our candied peels into smaller pieces. The peels dried in the unheated oven until Saturday evening. After enjoying dinner at Bocktown (BBQ chicken sandwich for me; habanero-mango chicken salad for SP) and enduring a trip to Walmart, we started the bread - only to quickly discover than somehow, we missed the word 'buttermilk' on the shopping list. Oops. Good thing GEMD is 2 minutes down the hill. Emergency run for buttermilk. Finally we got started. 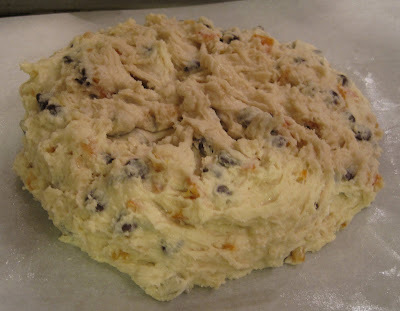 The dough was very sticky and when it was dumped on very well floured parchment paper, it looked to me like a blob of cookie dough - a giant cookie: SP worked the flour in, shaped it into a round, and scored the top in the suggested sunburst pattern. See how I let him get the messy, sticky hands?! I just 'supervised' and took photos. You can faintly see our sunburst scores: Then it went into the oven. Of course I had to peek in on it: A little over an hour later, we had bread: It cooled for about an hour and then we sampled a bit - just a bite each. It was tasty. A terrific crust. A great chocolate & orange taste. On Sunday, we sliced it and ate it during the Steelers game. Yum! Uncommon Market on Rt. 19 near South Hills Village has candied orange (and lemon) peel...just happened to see that when I was there this afternoon. They also have a vast array of dried fruits. I always forget about that place - and usually they have what I am looking for! I'll have to try harder to remember them next time we need an 'unusual' ingredient. Thanks! 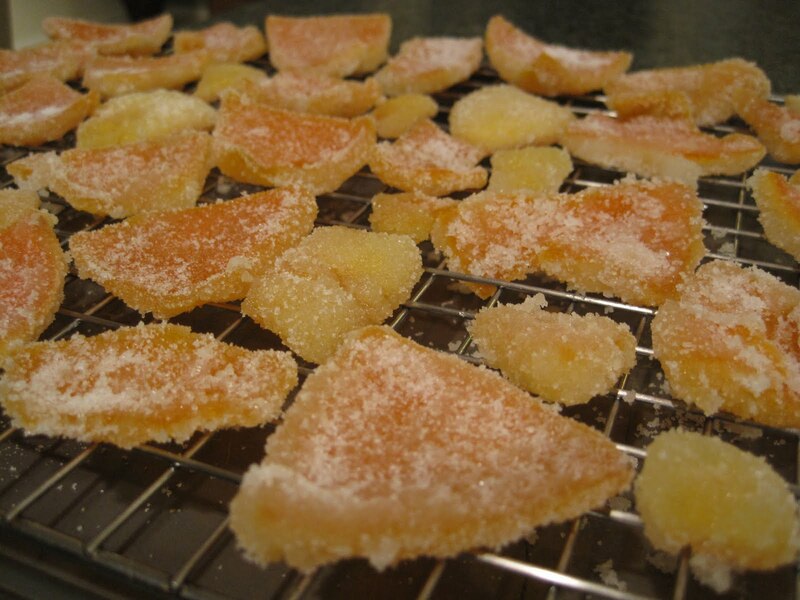 My dad and I used to make a giant batch of candied grapefruit peels every Christmas. This reminds me of that. Cool!